I would also like to offer my thoughts and prayers to the victims and everyone involved in the Virginia Tech shootings. This is such a horrible tragedy, and I really hope that none of you were victims! It’s sobering to realize that everyone is vulnerable, since we tend to think of school and college campuses as safe havens for learning. I’m just thankful that we haven’t had any incidents like this at the university I attend, and hopefully we won’t see any other incidents like this anytime soon! Please be safe my friends and readers, and enjoy your sushi! Cut the ham into 1.5″ x 2.5″ pieces. 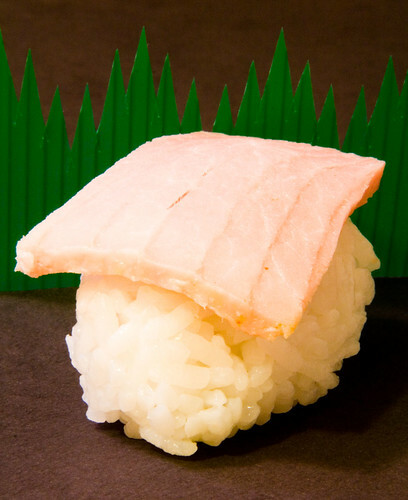 Place the piece of ham on top of the rice ball. You may place a small dab of wasabi on the underside of the ham if you wish. Serve with shoyu, wasabi, and ginger if desired. Something I really liked was dipping it in deli style mustard with horseradish. Yum! att. alejandro y berenice de susuÃ‚Â°shi…. Haha what a great idea! We still have oodles of ham leftover and I’ve been trying to think of ways to use it up (tonight I made a ham and cheese quiche). But this looks like it is pretty tasty…I’ll have to try it before the ham goes bad. Of course, I think that stuff is salty enough it keeps for a good 20 years or so. Ooh or maybe your fried rice inari with ham fried rice…. Amy – Hehe ooooh, ham in the fried rice inari sounds good too! Have fun eating up your ham! Oh, and by the way, are any of you really fluent in Spanish? I have absolutely no idea what that first comment says… for all I know it could be spam! 🙁 Could someone translate it for me so I can either respond appropriately to it or delete it? Thanks! This is an absolute sin… why would you desecrate such history and tradition with an atrocity like this? Americans are so good at destroying other peoples cultures. It is bad relly…i should not! Not sure i should thanks you…lol…nice try…keep testing! oh my God… sushi with ham! I can’t claim to understand the entire Spanish comment but it seems to be congratulating you on your restaurant. He says that him and his girlfriend just started their own business and that they would like you to give them advice on being successful. Considering that you apparently are only doing this for a hobby and do not run a sushi restaurant (not to mention the comment was from April of 2007) I think its okay if you just let it be lost in translation forever. I think people should try and push the boundaries with sushi and try something new. I love fusion food and if this can get people to eventually try traditional sushi I say it’s all good! Great idea for leftovers. I always thought sushi was pretty traditional, but the more I research it the more I find you can really be creative with the ingredients. Great site. Thanks!